Patrick Sawyer, left, and Jake Wilson are changing Chewelah's "Kokanee mindset," one craft beer at a time. It's a fairly active Saturday afternoon at Quartzite Brewing Company in the small town of Chewelah, Washington. Quartzite's co-owners and -brewers Patrick Sawyer and Jake Wilson are behind the bar, greeting a gaggle of regular patrons as they shuffle into the expansive and modern taproom. Half a dozen other drinkers — and a couple of friendly dogs — are spread out around the room, chatting and happily sipping on freshly poured pints. Upon first glance, one might think Quartzite Brewing was a microbrewery nestled in downtown Spokane, or even a bustling neighborhood of Seattle or Portland. But if you're looking to visit this particular craft brewery, you'll have to head an hour's drive north of Spokane to a rural town with a population around 2,600, where two young entrepreneurs have found fertile soil for their brewing roots. "The people here are amazing," says Wilson. "This town has a lot going for it." Sawyer agrees: "We really liked the energy here. It seemed like a lot of people were trying to make Chewelah a cooler town." Wilson, originally from just north in the slightly larger town of Colville, and Sawyer, a Denver transplant, connected through their mutual love for the outdoors and homebrewing. With the 49 Degrees North Ski Resort nearby and a surrounding abundance of biking and hiking trails, Chewelah seemed like the perfect place for the two young brewers to call home. The only thing missing was a constant supply of good craft beer. "I think it's pretty safe to say Chewelah is a Kokanee town," Sawyer remarks. Yet a shared love for their new hometown, paired with a thirst for good beer, soon gave the two an idea. In January of 2016, after more than a year of planning, Wilson and Sawyer officially opened the doors to Quartzite Brewing Company. The new business owners found a home for the brewery and taproom in a former auto shop building just outside Chewelah's downtown core. After naming their beer lineup after local geography (Quartzite is a nod to the looming mountain just east of town), like the Goddards Peak IPA or the Iron Mountain Stout, the two found out very quickly that their "Kokanee town" was ready for locally crafted beer. "We are flying through beer just about as fast as we brew it," says Sawyer, noting that the demand for Quartzite's beer has been high since day one. Brewing twice a week on their two-barrel system, Wilson and Sawyer have not yet been able to produce enough product to make it out the doors. Currently, all of their beer is consumed within the taproom, with much of that inventory downed by local patrons every weekend. Yet the two Quartzite brewers see these production challenges as a clear sign that the Chewelah community is behind them. Sawyer brings up the size of the crowd during the taproom's recent one-year anniversary celebration. "There was a line out the door of people wanting to drink our beer," he says. That's not to say that it's all easy drinking for the small brewery. Quartzite's patrons might be eager to try the brewery's new offerings, but it might take some finesse to sell them on what's in their glass. Wilson cites the newly released seasonal Gold Hill Gose as an example. "Some people take a sip and say, 'What the heck is going on there?' But we talk to them about the history of the Gose, and we always encourage people to take three sips before they judge the beer," he explains. The Gose, a traditional German sour wheat ale brewed with salt, is a style that's been gaining newfound popularity in regional craft beer hubs like Portland and Seattle. In Chewelah, beer trends move a little more slowly, and Sawyer says that's part of the fun. "A lot of what we do is education," he says. "But our customers are starting to learn the terms and what styles work for them." 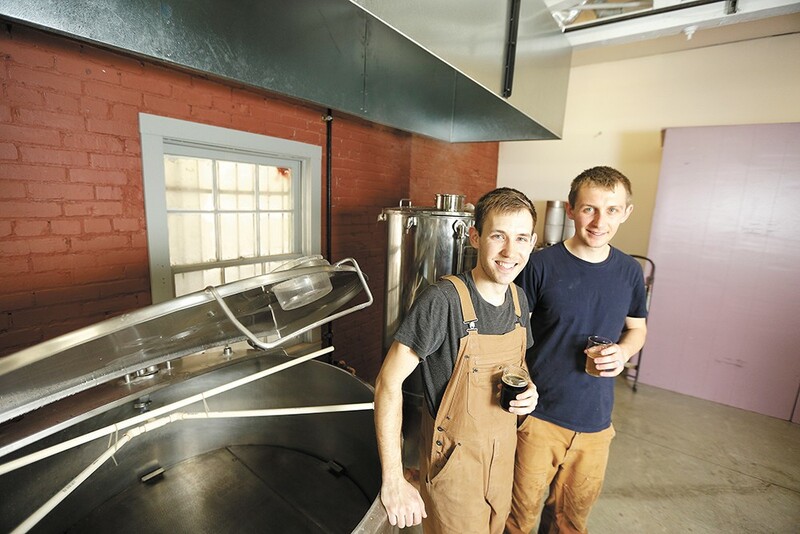 Wilson and Sawyer hope that in the near future, they'll be able to produce enough beer to have Quartzite brews on tap in places outside of Chewelah. But for now, they're content to serve it in the community that's in turn embraced their dream of bringing local beer to the town. "We always joke that everything in Chewelah exceeds your expectations," Sawyer remarks. And as Chewelah continues to support twentysomething go-getters like Wilson and Sawyer, those expectations are constantly being raised. Quartzite Brewing currently offers the following beers at the taproom: Iron Mountain Stout (5.1 percent alcohol by volume, 28 International Bittering Units); Goddards Peak IPA (6 percent ABV, 62 IBU), Angel Peak Amber (5.3 percent ABV, 34 IBU), Fools Prairie Kolsch (5.1 percent ABV, 21 IBU), Gold Hill Gose (4.5 percent ABV, 5 IBU), and Mill Butte Grisette (5.5 percent ABV, 17 IBU). Adam Boyd is an award-winning homebrewer, Assistant Brewer at Iron Goat Brewing, and host of "Good Brews" on KYRS Community Radio. What's your favorite brewing ingredient? Wilson: "Malt in general, it's just such a versatile ingredient." Sawyer: "Chinook hops! I love their smell, I want to use them all the time." Where's your favorite place to have a beer? Wilson: "The Oasis Tavern in Chewelah. It's a great place to relax after a day of brewing." Sawyer: "Going back to my Denver roots, Dry Dock Brewing. I loved the people there. It used to be my backyard brewery." When you aren't brewing/drinking beer, what are you up to? Wilson: "I'd definitely be out snowboarding or mountain biking." Sawyer: "I'd be out hiking or biking. Doing anything outdoors."